Thanks for you explanation, i ll try it on my flower store. Good explanation. I’ll try it on my webshop. I also read your ‘Add Tweet-this’ article and you’ll probably have one about Facebook (still looking for it). Do you also have a all-in-one extension that will insert the G+, TweetThis and Like buttons? I am hosting magento on cloud and the url is accessible public..I have followed the above steps.I am able to login but the button turns into red exclaimation mark!! Can anyone please tel me what s going wrong?? Does this work on 1.5? Followed every step exactly to the dot on a new fresh install and the button doesn’t show up on product’s page. Please advice!! Google plus buttons aren’t working on mobile devices, correct ?? Hey, can you provide the extension zip download?I found it didn’t work with magento16. Thanks for tutorial. There is a problem, at least for me. alert.urls block are not touched with gplusone.xml layout update. However it works good after placing update layout code to local.xml. And as I’m trying to learn Magento, I would like to know what is the reason that layout update doesn’t work from module xml file. It seems that updates are trying to applied before alert.urls block initialized. Is it right? Seems some good extension!!! Really You’re a goddamn genius. Thanks for the extension Branko! Was just thinking of implementing google+ in Magento. For those who are totally strangers with programming, it’s a simple way using Magento UI. It’s true that the +1 can’t be inserted anywhere, but it can be inserted in page. If you are using Google Webmaster Tools, go to http://www.google.com/webmasters/+1/button/ and after you configure as you want, you’ll find 2 parts of code which must be inserted in admin panel. it should be inserted in any CMS page (e.g. home) in editor HTML mode. SAVE THAT PAGE IN HTML MODE!!! 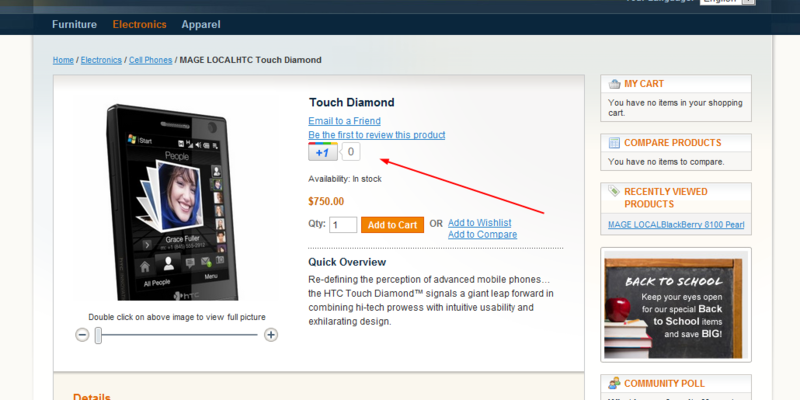 There is a bug in magento even in 1.5.1.0 and if you return in WYSIWYG mode will delete that code. Go to Configuration -> General -> Design -> Miscellaneous HTML and add that part here and save. Looks like a great extension. Is it going to be available on Magento Connect? Will it work for Enterprise edition?